At its annual Recognition Gala earlier this month, the Executive Leadership Foundation, the charitable arm of the Executive Leadership Council, honored the 82nd Attorney General of the United States, The Honorable Eric Holder, with the Global Game Changer award. After receiving a standing ovation from a crowd of influential business professionals, the nation?s first African-American Attorney General thanked the ELC, his colleagues at Covington & Burling and the Department of Justice and remarked, ?Our constituent parts are better when we are all included. We are a nation of strengths, least of not, the American people. We control our destiny. If we make available opportunities for ALL people, we can have American dominance and turn away from dated policies. We are not yet at a place where people are regarded solely for their good work, but we can get there. It is a great honor to receive this award. I look forward to all of you making real the promise of American democracy.??? Ambassador Ron Kirk, senior of counsel, Gibson, Dunn & Crutcher LLP and former U.S. Trade Representative, presented the award to Holder and regarded him as ?a leader who embodies transformational leadership and impact.? During his six-year tenure with the Department of Justice, Holder, a Columbia Law School graduate, worked unrelentingly to improve issues surrounding voting rights and civil rights. Throughout his tenure at Covington, an investigations and litigation practice, Holder has tried discrimination lawsuits and has represented several life science companies. In addition to the Game Changer award from the ELC, Holder, in 2014, was named to Time magazine?s list of 100 Most Influential People. Also honored was Kenneth C. Frazier, chairman of the board and CEO, Merck & Company, Inc., who received the Achievement Award. Bernard J. Tyson, chairman and CEO, Kaiser Permanente, presented the award. Upon acceptance, Frazier, who earned a law degree from Harvard University in 1987, dedicated his award to his colleagues and spoke of the accomplishments of noted African American doctors Charles Drew and Vivien Thomas and shed light on the UNCF/Merck Science Initiative. ?Building diverse companies is essential? Merck supports the ELC’?s educational programs and we hope to build a pipeline and continue to work together,? he said onstage. 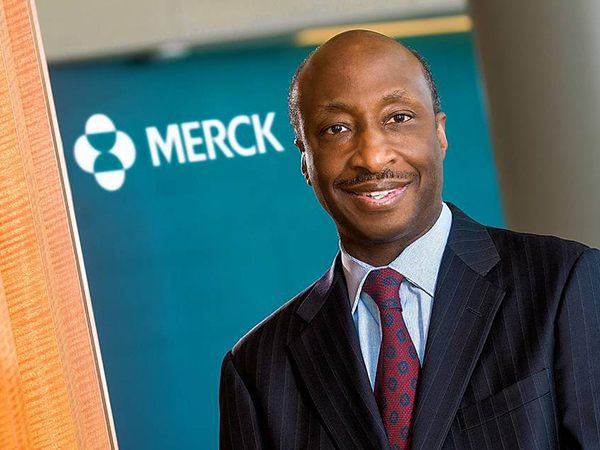 While previously serving as the company?s president, Frazier was responsible for Merck?s Global Human Health division, its Manufacturing division, and its Research Laboratories. He is one of only six Black CEOs currently heading a Fortune 500 company, and according to the ELC, only 15 Black executives have reached the level of leadership, as Frazier?s, in our nation?s largest corporations. ?I dream of when Black executives at Fortune 500 companies are no longer an anomaly, but the norm,? Rhonda Mims, Executive Leadership Foundation Chair, remarked when she took the stage to talk about the foundation?s youth programs. Hosted by Actress Nicole Ari Parker and Entertainment Tonight Co-Host Kevin Frazier, this year?s event was themed ?The Power of One.? Held at the Gaylord National Hotel in National Harbor, Maryland, the event was sponsored by Cisco, Prudential, Shell, AARP, Nationwide, and Morgan Stanley.?? ?Being a 20-plus year ELC member, I can say that this year?s Gala was one of our better galas, given how it all came together in recognizing the work we?ve accomplished through the ELC and the ELF and also the individuals and companies that we recognized and saluted,? Ronald Parker, ELC and ELF President and CEO, told TNJ.com. Most inspiring was when students from a variety of schools including Howard University, Spelman College and Bennett College were brought onstage to be recognized for earning scholarships as part of the foundation?s National Essay Competition and National Business Case Competition; and the Alvaro L. Martins and Ann Fudge Scholars initiatives. But perhaps one of the biggest highlights of the night was when the hosts announced that Cisco had, on the spot, decided to offer one of the students a job.